from LEGO, NECA, & Cards Inc. Check out the latest episode of Mugglecast from our friends over at Mugglenet.com. Andrew Sims and Lando talk about all of the new Harry Potter toys debuted at this years Toy Fair. Welcome Mugglecast listeners and of course loyal Millionaireplayboy.com readers. This year looks to be the biggest year for Harry Potter. First, the seventh and final book, Harry Potter and The Deathly Hallows is released on July 21st. Two weeks before the release of Book 7, Harry Potter and the Order of the Phoenix hits theaters on July 13th. A slew of Harry Potter merchandise is about to hit stores all based on the fifth film. This year at Toy Fair Millionaireplayboy.com got a good look at all of the new products based on Harry Potter. From action figures to LEGOs to various Potter merchandise, MillionairePlayboy.com has all the latest news about everything Potter. This year we also began a video podcast. You can watch the special Toy Fair Podcast that includes Harry Potter products and other toys we saw at Toy Fair. You can now subscribe to this podcast through iTunes! Click here to launch our page and pick out episodes. Subscription is free. Stay iTuned for more details. In my opinion the only Harry Potter toys up until this point worth the plastic they are made of is the movie the med Harry Potter LEGO sets. At the 2007 Toy Fair Collectors Preview Party, LEGO, revealed the only set based on the film Order of the Phoenix, set number 5378: Hogwarts Castle. The 943 piece castle is broken up into three parts, a section of Hogwarts with the Snapes Potion room and Umbridge's office, the green house, and Room of Requirements. The set will also include minifigures Harry Potter, Ron Weasley, Hermione Granger (with a new hair piece), Albus Dumbledore, Hagrid, a Thestral, Draco & Severus Snape (with a new facial expression, Dolores Umbridge. This is the third version of Hogwarts castle that LEGO has released. Hopefully, Potter fans will create a demand for further LEGO potter sets. If it was up for me I would love to see a Ministry of Magic set, St. Mungo's, and a set based on the Fred & George leaving Hogwarts. Last year when it was announced that NECA acquired the Harry Potter license away from Mattel I was extant. As a collector of action figures I have been very displeased that there has not been a successful Harry Potter figure line. How can that be? Harry Potter is as big as Star Wars if not more. Some have argued that Harry Potter fans are not action figure collectors. I disagree. I just think that people know crap when they see it and Mattel's Potter figures were just that crap. Earlier this year NECA released images of the first wave of 7" Harry Potter action figures from Goblet of Fire. These figures hit stores in March consisting of Harry Potter, Voldemort, a Dementor, and two different Death Eater figures. At Toy Fair NECA allowed MillioniarePlayboy.com to check out the new figures for Order of the Phoenix. These are even better than I could have imagined. NECA plans on releasing these figures in two series. Along with series 1 you can expect a massive box set of Harry vs. Voldermort in front of the Crypt. 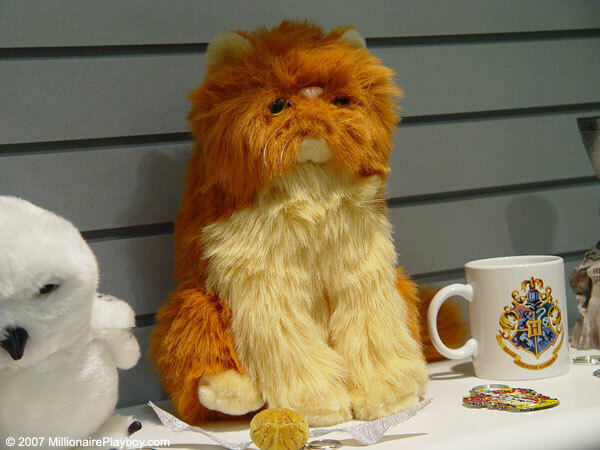 A special deluxe 10" Hagrid will be released with Fang and Norbert. This figure will be kept in scale with the rest of the 7" Harry Potter figures. 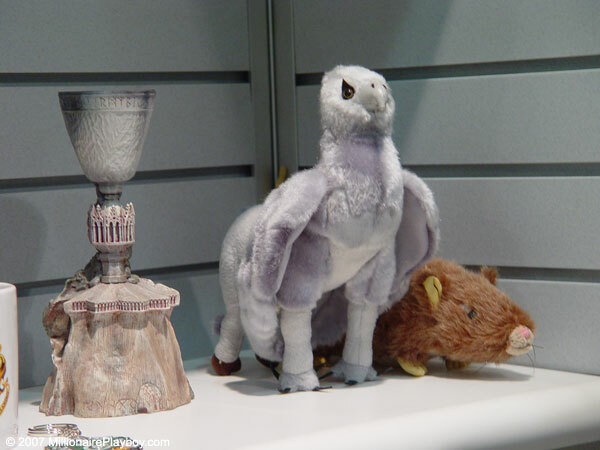 For Potter fans not interested in collecting action figures, NECA is also releasing a line of plush toys of the Harry Potter creatures Hedwig, Crookshanks, Scabbers, and Buckbeak. Other products include lunch boxes, replica of the Sorting Hat, and a Marauder's Map Pillow. I am very surprised that there is going to be two different action figure lines for Harry Potter. The licensing agreement is complicated. NECA is licensed to release figures in North America, Latin America, and Asia. In Europe, Cards, Inc, a UK company, is licensed to release figures and is now also distributing the figure line in America through Corgi. The line is different from the NECA line. The Cards, Inc line is 3.75" scale. The same size as Star Wars and GI-JOE figures. From the pictures it looks like they have about 14 points of articulation and will come with accessories. At Toy Fair we were given a sneak peek at the line. While we were not allowed to take photographs we did get a glimpse of the other figures that will be included. I can say that I have seen figures for Ron, Hermione, Ginny, Hagrid, Luna, & Snape. There was also a playset of what I believe to be the Gryffindor Common Room. It looks like we will be seeing the first wave of figures in June. I believe that this is probably the biggest year for Harry Potter merchandise. Not including Gentle Giant, which is releasing additional sculpts and Harry Potter Bust-Ups. I find myslef most excited about the NECA figures. NECA has consistently released great action figures and finally give Harry Potter the figures they deserve. I find that the best sculpts are of the Sirius Black and Hermione Granger figures. Flawless. Of course, I am also excited for LEGO's Hogwarts Castle. I am hoping this set will work with the previous Hogwarts sets to build a giant school. I am cautious about the Cards, Inc. They look decent but they can't compare to the beautiful sculpted NECA figures. Even if they are not as great look at all the merchandise! I predict Potter fans will be emptying their wallets with figures, plush merchandise, and of course Book 7! You can't forget about that. Do you want to find your favorite toy? Relive your childhood memories with a bean bag chair! If you like foam chairs then you'll love the selection of a luv sac you'll be able to find on the net. Bean bag chairs can come in many of sizes and shapes, almost anything you could want. All LEGO and NECA images are ©2007 MillionairePlayboy.com.